For other uses, see Bahrain (disambiguation). Bahrain (/bɑːˈreɪn/ ( listen); Arabic: البحرين‎ al-Baḥrayn Arabic pronunciation: [aɫ baħrajn] ( listen)), officially the Kingdom of Bahrain (Arabic: مملكة البحرين‎ Mamlakat al-Baḥrayn), is an island country in the Persian Gulf. The sovereign state comprises a small archipelago centered around Bahrain Island, situated between the Qatar peninsula and the north eastern coast of Saudi Arabia, to which it is connected by the 25-kilometre (16 mi) King Fahd Causeway. Bahrain's population is 1,234,571 (c. 2010), including 666,172 non-nationals. It is 765.3 square kilometres (295.5 sq mi) in size, making it the third-smallest nation in Asia after the Maldives and Singapore. Bahrain is the site of the ancient Dilmun civilisation. It has been famed since antiquity for its pearl fisheries, which were considered the best in the world into the 19th century. Bahrain was one of the earliest areas to convert to Islam, in 628 CE. Following a period of Arab rule, Bahrain was occupied by the Portuguese in 1521, who in turn were expelled in 1602 by Shah Abbas I of the Safavid dynasty under the Persian Empire. In 1783, the Bani Utbah clan captured Bahrain from Nasr Al-Madhkur and it has since been ruled by the Al Khalifa royal family, with Ahmed al Fateh as Bahrain's first hakim. In the late 1800s, following successive treaties with the British, Bahrain became a protectorate of the United Kingdom. In 1971, Bahrain declared independence. Formerly an emirate, the Arab constitutional monarchy of Bahrain was declared a kingdom in 2002. In 2011, the country experienced protests inspired by the regional Arab Spring. Bahrain's ruling al-Khalifa royal family has been accused and criticized for human rights abuses, including imprisonment, torture and execution of dissidents, political opposition figures and its Shia Muslim population. Bahrain had the first post-oil economy in the Persian Gulf. Since the late 20th century, Bahrain has invested in the banking and tourism sectors. Many large financial institutions have a presence in Manama, the country's capital. It has a high Human Development Index and is recognised by the World Bank as a high-income economy. Bahrain is a member of the United Nations, Non-Aligned Movement, Arab League, Organisation of Islamic Cooperation and the Gulf Cooperation Council. ✪ Awesome Things to Do in Bahrain! Bahrayn is the dual form of Arabic bahr ("sea"), so al-Bahrayn originally means "the two seas". However, the name has been lexicalised as a feminine proper noun and does not follow the grammatical rules for duals; thus its form is always Bahrayn and never Bahrān, the expected nominative form. Endings are added to the word with no changes, as in the name of the national anthem Bahraynunā ("our Bahrain") or the demonym Bahraynī. The mediaeval grammarian al-Jawahari commented on this saying that the more formally correct term Bahrī (lit. "belonging to the sea") would have been misunderstood and so was unused. Today, Bahrain's "two seas" are generally taken to be the bay east and west of the island, the seas north and south of the island, or the salt and fresh water present above and below the ground. In addition to wells, there are areas of the sea north of Bahrain where fresh water bubbles up in the middle of the salt water as noted by visitors since antiquity. An alternate theory with regard to Bahrain's toponymy is offered by the al-Ahsa region, which suggests that the two seas were the Great Green Ocean (the Persian Gulf) and a peaceful lake on the Arabian mainland. 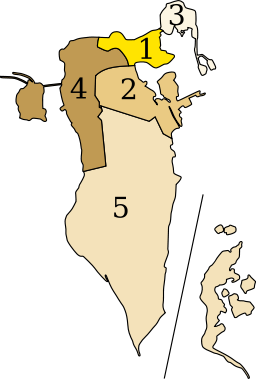 Until the late Middle Ages, "Bahrain" referred to the region of Eastern Arabia that included Southern Iraq, Kuwait, Al-Hasa, Qatif, and Bahrain. The region stretched from Basra in Iraq to the Strait of Hormuz in Oman. This was Iqlīm al-Bahrayn's "Bahrayn Province". The exact date at which the term "Bahrain" began to refer solely to the Awal archipelago is unknown. The entire coastal strip of Eastern Arabia was known as "Bahrain" for a millennium. The island and kingdom were also commonly spelled Bahrein into the 1950s. Map showing the locations of the ancient burial mounds. There are an estimated 350,000 burial mounds. The Persian Empire in Sassanid era at its peak during the reign of Khosrau II (590–628). Bahrain was home to Dilmun, an important Bronze Age trade centre linking Mesopotamia and the Indus Valley. Bahrain was later ruled by the Assyrians and Babylonians. From the sixth to third century BCE, Bahrain was part of the Achaemenid Empire. By about 250 BCE, Parthia brought the Persian Gulf under its control and extended its influence as far as Oman. The Parthians established garrisons along the southern coast of the Persian Gulf to control trade routes. During the classical era, Bahrain was referred to by the ancient Greeks as Tylos, the centre of pearl trading, when the Greek admiral Nearchus serving under Alexander the Great landed on Bahrain. Nearchus is believed to have been the first of Alexander's commanders to visit the island, and he found a verdant land that was part of a wide trading network; he recorded: "That on the island of Tylos, situated in the Persian Gulf, are large plantations of cotton trees, from which are manufactured clothes called sindones, of strongly differing degrees of value, some being costly, others less expensive. The use of these is not confined to India, but extends to Arabia." The Greek historian Theophrastus states that much of Bahrain was covered by these cotton trees and that Bahrain was famous for exporting walking canes engraved with emblems that were customarily carried in Babylon. The Greek historian Strabo believed the Phoenicians originate from Bahrain. Herodotus also believed that the homeland of the Phoenicians was Bahrain. This theory was accepted by the 19th-century German classicist Arnold Heeren who said that: "In the Greek geographers, for instance, we read of two islands, named Tyrus or Tylos, and Aradus, which boasted that they were the mother country of the Phoenicians, and exhibited relics of Phoenician temples." The people of Tyre in particular have long maintained Persian Gulf origins, and the similarity in the words "Tylos" and "Tyre" has been commented upon. However, there is little evidence of any human settlement at all on Bahrain during the time when such migration had supposedly taken place. In the 3rd century, Ardashir I, the first ruler of the Sassanid dynasty, marched on Oman and Bahrain, where he defeated Sanatruq the ruler of Bahrain. At this time, Bahrain was known as Mishmahig (which in Middle-Persian/Pahlavi means "ewe-fish"). Bahrain was also the site of worship of an ox deity called Awal. Worshipers built a large statue to Awal in Muharraq, although it has now been lost. For many centuries after Tylos, Bahrain was known as Awal. By the 5th century, Bahrain became a centre for Nestorian Christianity, with the village Samahij as the seat of bishops. In 410, according to the Oriental Syriac Church synodal records, a bishop named Batai was excommunicated from the church in Bahrain. As a sect, the Nestorians were often persecuted as heretics by the Byzantine Empire, but Bahrain was outside the Empire's control, offering some safety. The names of several Muharraq villages today reflect Bahrain's Christian legacy, with Al Dair meaning "the monastery". Bahrain's pre-Islamic population consisted of Christian Arabs (mostly Abd al-Qays), Persians (Zoroastrians), Jews, and Aramaic-speaking agriculturalists. According to Robert Bertram Serjeant, the Baharna may be the Arabised "descendants of converts from the original population of Christians (Aramaeans), Jews and Persians inhabiting the island and cultivated coastal provinces of Eastern Arabia at the time of the Muslim conquest". The sedentary people of pre-Islamic Bahrain were Aramaic speakers and to some degree Persian speakers, while Syriac functioned as a liturgical language. Muhammad's first interaction with the people of Bahrain was the Al Kudr Invasion. Muhammad ordered a surprise attack on the Banu Salim tribe for allegedly plotting to attack Medina. He had received news that some tribes were assembling an army on Bahrain and preparing to attack the mainland. But the tribesmen retreated when they learned Muhammad was leading an army to do battle with them. Traditional Islamic accounts state that Al-Ala'a Al-Hadrami was sent as an envoy during the Expedition of Zayd ibn Harithah (Hisma) to the Bahrain region by the prophet Muhammad in AD 628 and that Munzir ibn Sawa Al Tamimi, the local ruler, responded to his mission and converted the entire area. In 899, the Qarmatians, a millenarian Ismaili Muslim sect, seized Bahrain, seeking to create a utopian society based on reason and redistribution of property among initiates. Thereafter, the Qarmatians demanded tribute from the caliph in Baghdad, and in 930 sacked Mecca and Medina, bringing the sacred Black Stone back to their base in Ahsa, in medieval Bahrain, for ransom. According to historian Al-Juwayni, the stone was returned 22 years later in 951 under mysterious circumstances. Wrapped in a sack, it was thrown into the Great Mosque of Kufa in Iraq, accompanied by a note saying "By command we took it, and by command we have brought it back." The theft and removal of the Black Stone caused it to break into seven pieces. Following their 976 defeat by the Abbasids, the Qarmatians were overthrown by the Arab Uyunid dynasty of al-Hasa, who took over the entire Bahrain region in 1076. The Uyunids controlled Bahrain until 1235, when the archipelago was briefly occupied by the Persian ruler of Fars. In 1253, the Bedouin Usfurids brought down the Uyunid dynasty, thereby gaining control over eastern Arabia, including the islands of Bahrain. In 1330, the archipelago became a tributary state of the rulers of Hormuz, though locally the islands were controlled by the Shi'ite Jarwanid dynasty of Qatif. In the mid-15th century, the archipelago came under the rule of the Jabrids, a Bedouin dynasty also based in Al-Ahsa that ruled most of eastern Arabia. Arad Fort in Arad; constructed before the Portuguese assumed control. In 1521, the Portuguese Empire allied with Hormuz and seized Bahrain from the Jabrid ruler Muqrin ibn Zamil, who was killed during the takeover. Portuguese rule lasted for around 80 years, during which time they depended mainly on Sunni Persian governors. The Portuguese were expelled from the islands in 1602 by Abbas I of the Safavid Empire, which gave impetus to Shia Islam. For the next two centuries, Persian rulers retained control of the archipelago, interrupted by the 1717 and 1738 invasions of the Ibadis of Oman. During most of this period, they resorted to governing Bahrain indirectly, either through the city of Bushehr or through immigrant Sunni Arab clans. The latter were tribes returning to the Arabian side of the Persian Gulf from Persian territories in the north who were known as Huwala. In 1753, the Huwala clan of Nasr Al-Madhkur invaded Bahrain on behalf of the Iranian Zand leader Karim Khan Zand and restored direct Iranian rule. In 1783, Al-Madhkur lost the islands of Bahrain following his defeat by the Bani Utbah tribe at the 1782 Battle of Zubarah. Bahrain was not new territory to the Bani Utbah; they had been a presence there since the 17th century. During that time, they started purchasing date palm gardens in Bahrain; a document shows that 81 years before arrival of the Al-Khalifa, one of the shaikhs of the Al Bin Ali tribe (an offshoot of the Bani Utbah) had bought a palm garden from Mariam bint Ahmed Al Sanadi in Sitra island. The Al Bin Ali were the dominant group controlling the town of Zubarah on the Qatar peninsula, originally the center of power of the Bani Utbah. After the Bani Utbah gained control of Bahrain, the Al Bin Ali had a practically independent status there as a self-governing tribe. They used a flag with four red and three white stripes, called the Al-Sulami flag in Bahrain, Qatar, Kuwait, and the Eastern province of the Kingdom of Saudi Arabia. Later, different Arab family clans and tribes from Qatar moved to Bahrain to settle after the fall of Nasr Al-Madhkur of Bushehr. These families included the House of Khalifa, Al-Ma'awdah, Al-Fadhil, Al-Mannai, Al-Noaimi, Al-Sulaiti, Al-Sadah, Al-Thawadi and other families and tribes. The House of Khalifa moved from Qatar to Bahrain in 1799. Originally, their ancestors were expelled from Umm Qasr in central Arabia by the Ottomans due to their predatory habits of preying on caravans in Basra and trading ships in Shatt al-Arab waterway until Turks expelled them to Kuwait in 1716, where they remained until 1766. Around the 1760s, the Al Jalahma and House of Khalifa, both belonging to the Utub Federation, migrated to Zubarah in modern-day Qatar, leaving Al Sabah as the sole proprietors of Kuwait. In the early 19th century, Bahrain was invaded by both the Omanis and the Al Sauds. In 1802 it was governed by a 12-year-old child, when the Omani ruler Sayyid Sultan installed his son, Salim, as governor in the Arad Fort. In 1816, the British political resident in the Gulf, William Bruce, received a letter from the Sheikh of Bahrain who was concerned about a rumour that Britain would support an attack on the island by the Imam of Muscat. He sailed to Bahrain to reassure the Sheikh that this was not the case and drew up an informal agreement assuring the Sheikh that Britain would remain a neutral party. In 1820, the Al Khalifa tribe were recognised by Great Britain as the rulers ("Al-Hakim" in Arabic) of Bahrain after signing a treaty relationship. However, ten years later they were forced to pay yearly tributes to Egypt despite seeking Persian and British protection. In 1860, the Al Khalifas used the same tactic when the British tried to overpower Bahrain. Writing letters to the Persians and Ottomans, Al Khalifas agreed to place Bahrain under the latter's protection in March due to offering better conditions. Eventually the Government of British India overpowered Bahrain when the Persians refused to protect it. Colonel Pelly signed a new treaty with Al Khalifas placing Bahrain under British rule and protection. Following the Qatari–Bahraini War in 1868, British representatives signed another agreement with the Al Khalifas. It specified that the ruler could not dispose of any of his territory except to the United Kingdom and could not enter into relationships with any foreign government without British consent. In return the British promised to protect Bahrain from all aggression by sea and to lend support in case of land attack. More importantly the British promised to support the rule of the Al Khalifa in Bahrain, securing its unstable position as rulers of the country. Other agreements in 1880 and 1892 sealed the protectorate status of Bahrain to the British. Unrest amongst the people of Bahrain began when Britain officially established complete dominance over the territory in 1892. The first revolt and widespread uprising took place in March 1895 against Sheikh Issa bin Ali, then ruler of Bahrain. Sheikh Issa was the first of the Al Khalifa to rule without Persian relations. Sir Arnold Wilson, Britain's representative in the Persian Gulf and author of The Persian Gulf, arrived in Bahrain from Muscat at this time. The uprising developed further with some protesters killed by British forces. Before the development of petroleum, the island was largely devoted to pearl fisheries and, as late as the 19th century, was considered to be the finest in the world. In 1903, German explorer, Hermann Burchardt, visited Bahrain and took many photographs of historical sites, including the old Qaṣr es-Sheikh, photos now stored at the Ethnological Museum of Berlin. Prior to the First World War, there were about 400 vessels hunting pearls and an annual export of more than £30,000. In 1911, a group of Bahraini merchants demanded restrictions on the British influence in the country. The group's leaders were subsequently arrested and exiled to India. In 1923, the British introduced administrative reforms and replaced Sheikh Issa bin Ali with his son. Some clerical opponents and families such as al Dossari left or were exiled to Saudi Arabia and Iran. Three years later the British placed the country under the de facto rule of Charles Belgrave who operated as an adviser to the ruler until 1957. Belgrave brought a number of reforms such as establishment of the country's first modern school in 1919, the Persian Gulf's first girls' school in 1928 and the abolition of slavery in 1937. At the same time, the pearl diving industry developed at a rapid pace. In 1927, Rezā Shāh, then Shah of Iran, demanded sovereignty over Bahrain in a letter to the League of Nations, a move that prompted Belgrave to undertake harsh measures including encouraging conflicts between Shia and Sunni Muslims in order to bring down the uprisings and limit the Iranian influence. Belgrave even went further by suggesting to rename the Persian Gulf to the "Arabian Gulf"; however, the proposal was refused by the British government. Britain's interest in Bahrain's development was motivated by concerns over Saudi and Iranian ambitions in the region. The Bahrain Petroleum Company (Bapco), a subsidiary of the Standard Oil Company of California (Socal), discovered oil in 1931 and production began the following year. This was to bring rapid modernisation to Bahrain. Relations with the United Kingdom became closer, as evidenced by the British Royal Navy moving its entire Middle Eastern command from Bushehr in Iran to Bahrain in 1935. In the early 1930s, Bahrain Airport was developed. Imperial Airways flew there, including the Handley Page HP42 aircraft. Later in the same decade the Bahrain Maritime Airport was established, for flying-boats and seaplanes. Bahrain participated in the Second World War on the Allied side, joining on 10 September 1939. On 19 October 1940, four Italian SM.82s bombers bombed Bahrain alongside Dhahran oilfields in Saudi Arabia, targeting Allied-operated oil refineries. Although minimal damage was caused in both locations, the attack forced the Allies to upgrade Bahrain's defences, an action which further stretched Allied military resources. After World War II, increasing anti-British sentiment spread throughout the Arab World and led to riots in Bahrain. The riots focused on the Jewish community. In 1948, following rising hostilities and looting, most members of Bahrain's Jewish community abandoned their properties and evacuated to Bombay, later settling in Israel (Pardes Hanna-Karkur) and the United Kingdom. As of 2008[update], 37 Jews remained in the country. In the 1950s, the National Union Committee, formed by reformists following sectarian clashes, demanded an elected popular assembly, removal of Belgrave and carried out a number of protests and general strikes. In 1965 a month-long uprising broke out after hundreds of workers at the Bahrain Petroleum Company were laid off. On 15 August 1971, though the Shah of Iran was claiming historical sovereignty over Bahrain, he accepted a referendum held by the United Nations and eventually Bahrain declared independence and signed a new treaty of friendship with the United Kingdom. Bahrain joined the United Nations and the Arab League later in the year. The oil boom of the 1970s benefited Bahrain greatly, although the subsequent downturn hurt the economy. The country had already begun diversification of its economy and benefited further from the Lebanese Civil War in the 1970s and 1980s, when Bahrain replaced Beirut as the Middle East's financial hub after Lebanon's large banking sector was driven out of the country by the war. Following the 1979 Islamic revolution in Iran in 1981, the Bahraini Shia population orchestrated a failed coup attempt under the auspices of a front organisation, the Islamic Front for the Liberation of Bahrain. The coup would have installed a Shia cleric exiled in Iran, Hujjatu l-Islām Hādī al-Mudarrisī, as supreme leader heading a theocratic government. In December 1994, a group of youths threw stones at female runners for running bare-legged during an international marathon. The resulting clash with police soon grew into civil unrest. A popular uprising occurred between 1994 and 2000 in which leftists, liberals and Islamists joined forces. The event resulted in approximately forty deaths and ended after Hamad bin Isa Al Khalifa became the Emir of Bahrain in 1999. He instituted elections for parliament, gave women the right to vote, and released all political prisoners. A referendum on 14–15 February 2001 massively supported the National Action Charter. As part of the adoption of the National Action Charter on 14 February 2002, Bahrain changed its formal name from the State (dawla) of Bahrain to the Kingdom of Bahrain. The country participated in military action against the Taliban in October 2001 by deploying a frigate in the Arabian Sea for rescue and humanitarian operations. As a result, in November of that year, US president George W. Bush's administration designated Bahrain as a "major non-NATO ally". Bahrain opposed the invasion of Iraq and had offered Saddam Hussein asylum in the days prior to the invasion. Relations improved with neighbouring Qatar after the border dispute over the Hawar Islands was resolved by the International Court of Justice in The Hague in 2001. Following the political liberalisation of the country, Bahrain negotiated a free trade agreement with the United States in 2004. Inspired by the regional Arab Spring, Bahrain's Shia majority started large protests against its Sunni rulers in early 2011.:162–3 The government initially allowed protests following a pre-dawn raid on protesters camped in Pearl Roundabout. :73–4, 88 A month later it requested security assistance from Saudi Arabia and other Gulf Cooperation Council countries and declared a three-month state of emergency. :132–9 The government then launched a crackdown on the opposition that included conducting thousands of arrests and systematic torture. Almost daily clashes between protesters and security forces led to dozens of deaths. Protests, sometimes staged by opposition parties, were ongoing. More than 80 civilians and 13 policemen have been killed as of March 2014[update]. According to Physicians for Human Rights, 34 of these deaths were related to government usage of tear gas originally manufactured by U.S.-based Federal Laboratories. The lack of coverage by Arab media in the Persian Gulf, as compared to other Arab Spring uprisings, has sparked several controversies. Iran is alleged by United States and others to have a hand in the arming of Bahraini militants. Bahrain is a generally flat and arid archipelago in the Persian Gulf. It consists of a low desert plain rising gently to a low central escarpment with the highest point the 134 m (440 ft) Mountain of Smoke (Jabal ad Dukhan). Bahrain had a total area of 665 km2 (257 sq mi) but due to land reclamation, the area increased to 765 km2 (295 sq mi), which is slightly larger than Hamburg or the Isle of Man. Often described as an archipelago of 33 islands, extensive land reclamation projects have changed this; by August 2008 the number of islands and island groups had increased to 84. Bahrain does not share a land boundary with another country but does have a 161 km (100 mi) coastline. The country also claims a further 22 km (12 nmi) of territorial sea and a 44 km (24 nmi) contiguous zone. Bahrain's largest islands are Bahrain Island, the Hawar Islands, Muharraq Island, Umm an Nasan, and Sitra. Bahrain has mild winters and very hot, humid summers. The country's natural resources include large quantities of oil and natural gas as well as fish in the offshore waters. Arable land constitutes only 2.82% of the total area. About 92% of Bahrain is desert with periodic droughts and dust storms, the main natural hazards for Bahrainis. Environmental issues facing Bahrain include desertification resulting from the degradation of limited arable land, coastal degradation (damage to coastlines, coral reefs, and sea vegetation) resulting from oil spills and other discharges from large tankers, oil refineries, distribution stations, and illegal land reclamation at places such as Tubli Bay. The agricultural and domestic sectors' over-utilisation of the Dammam Aquifer, the principal aquifer in Bahrain, has led to its salinisation by adjacent brackish and saline water bodies. A hydrochemical study identified the locations of the sources of aquifer salinisation and delineated their areas of influence. The investigation indicates that the aquifer water quality is significantly modified as groundwater flows from the northwestern parts of Bahrain, where the aquifer receives its water by lateral underflow from eastern Saudi Arabia, to the southern and southeastern parts. Four types of salinisation of the aquifer are identified: brackish-water up-flow from the underlying brackish-water zones in north-central, western, and eastern regions; seawater intrusion in the eastern region; intrusion of sabkha water in the southwestern region; and irrigation return flow in a local area in the western region. Four alternatives for the management of groundwater quality that are available to the water authorities in Bahrain are discussed and their priority areas are proposed, based on the type and extent of each salinisation source, in addition to groundwater use in that area. The Zagros Mountains across the Persian Gulf in Iran cause low-level winds to be directed toward Bahrain. Dust storms from Iraq and Saudi Arabia transported by northwesterly winds, locally called shamal wind, causing reduced visibility in the months of June and July. Greater flamingos (Phoenicopterus roseus) are native to Bahrain. More than 330 species of birds were recorded in the Bahrain archipelago, 26 species of which breed in the country. Millions of migratory birds pass through the Persian Gulf region in the winter and autumn months. One globally endangered species, Chlamydotis undulata, is a regular migrant in the autumn. The many islands and shallow seas of Bahrain are globally important for the breeding of the Socotra cormorant; up to 100,000 pairs of these birds were recorded over the Hawar islands. Only 18 species of mammals are found in Bahrain, animals such as gazelles, desert rabbits and hedgehogs are common in the wild but the Arabian oryx was hunted to extinction on the island. Twenty-five species of amphibians and reptiles were recorded as well as 21 species of butterflies and 307 species of flora. The marine biotopes are diverse and include extensive sea grass beds and mudflats, patchy coral reefs as well as offshore islands. Sea grass beds are important foraging grounds for some threatened species such as dugongs and the green turtle. In 2003, Bahrain banned the capture of sea cows, marine turtles and dolphins within its territorial waters. The Hawar Islands Protected Area provides valuable feeding and breeding grounds for a variety of migratory seabirds, it is an internationally recognised site for bird migration. The breeding colony of Socotra cormorant on Hawar Islands is the largest in the world, and the dugongs foraging around the archipelago form the second-largest dugong aggregation after Australia. Al Areen Wildlife Park, which is a zoo and a breeding centre for endangered animals, is the only protected area on land and also the only protected area which is managed on a day-to-day basis. Bahrain under the Al-Khalifa is a constitutional monarchy headed by the King, Shaikh Hamad bin Isa Al Khalifa. King Hamad enjoys wide executive powers which include appointing the Prime Minister and his ministers, commanding the army, chairing the Higher Judicial Council, appointing the parliament's upper house and dissolving its elected lower house. (p15) The head of government is the unelected prime minister, Shaikh Khalīfa bin Salman Al Khalifa, the uncle of the current king who has served in this position since 1971, making him the longest-serving prime minister in the world. In 2010, about half of the government was composed of the Al Khalifa family. In 1973, the country held its first parliamentary elections; however, two years later, the late emir dissolved the parliament and suspended the constitution after parliament rejected the State Security Law. The period between 2002 and 2010 saw three parliamentary elections. The first, held in 2002 was boycotted by the opposition, Al Wefaq, which won a majority in the second in 2006 and third in 2010. The 2011 by-election was held to replace 18 members of Al Wefaq who resigned in protest against government crackdown. The opening up of politics saw big gains for both Shīa and Sunnī Islamists in elections, which gave them a parliamentary platform to pursue their policies. It gave a new prominence to clerics within the political system, with the most senior Shia religious leader, Sheikh Isa Qassim, playing a vital role. This was especially evident when in 2005 the government called off the Shia branch of the "Family law" after over 100,000 Shia took to the streets. Islamists opposed the law because "neither elected MPs nor the government has the authority to change the law because these institutions could misinterpret the word of God". The law was supported by women activists who said they were "suffering in silence". They managed to organise a rally attended by 500 participants. Ghada Jamsheer, a leading woman activist said the government was using the law as a "bargaining tool with opposition Islamic groups". Analysts of democratisation in the Middle East cite the Islamists' references to respect human rights in their justification for these programmes as evidence that these groups can serve as a progressive force in the region. Some Islamist parties have been particularly critical of the government's readiness to sign international treaties such as the United Nations' International Convention on Civil and Political Rights. At a parliamentary session in June 2006 to discuss ratification of the Convention, Sheikh Adel Mouwda, the former leader of salafist party, Asalah, explained the party's objections: "The convention has been tailored by our enemies, God kill them all, to serve their needs and protect their interests rather than ours. This why we have eyes from the American Embassy watching us during our sessions, to ensure things are swinging their way". The period between 1975 and 1999 known as the "State Security Law Era", saw wide range of human rights violations including arbitrary arrests, detention without trial, torture and forced exile. After the Emir Hamad Al Khalifa (now king) succeeded his father Isa Al Khalifa in 1999, he introduced wide reforms and human rights improved significantly. These moves were described by Amnesty International as representing a "historic period of human rights". Human rights conditions started to decline by 2007 when torture began to be employed again. In 2011, Human Rights Watch described the country's human rights situation as "dismal". Due to this, Bahrain lost some of the high International rankings it had gained before. In 2011, Bahrain was criticised for its crackdown on the Arab spring uprising. In September, a government appointed commission confirmed reports of grave human rights violations including systematic torture. The government promised to introduce reforms and avoid repeating the "painful events". However, reports by human rights organisations Amnesty International and Human Rights Watch issued in April 2012 said the same violations were still happening. The documentary TV film Bahrain: Shouting in the Dark which was produced by the Qatari channel Al Jazeera, talks about the Bahraini protests during 2011. This TV film showed all the violations that have been taken against the rights of Bahraini citizens during the uprising. It also caused some problems between the Bahraini and the Qatari governments. Relations between Bahrain and Qatar improved following a meeting of the Gulf Cooperation Council in November 2014 in which it was announced Bahrain diplomats would return to Qatar. Amnesty International's 2015 report on the country points to continued suppression of dissent, restricted freedom of expression, unjust imprisonment, and frequent torture and other ill-treatment of its citizens. Human Rights Watch in its 2015 report described the situation of a Shia majority as more than tragic. Freedom House labels Bahrain as "not free" in its 2016 report. On 7 July 2016, the European Parliament adopted, with a large majority, a resolution condemning human rights abuses performed by Bahraini authorities, and strongly called for an end to the ongoing repression against the country's human rights defenders, political opposition and civil society. Women in Bahrain acquired voting rights and the right to stand in national elections in the 2002 election. However, no women were elected to office in that year's polls. In response to the failure of women candidates, six were appointed to the Shura Council, which also includes representatives of the Kingdom's indigenous Jewish and Christian communities. Dr. Nada Haffadh became the country's first female cabinet minister on her appointment as Minister of Health in 2004. The quasi-governmental women's group, the Supreme Council for Women, trained female candidates to take part in the 2006 general election. When Bahrain was elected to head the United Nations General Assembly in 2006 it appointed lawyer and women's rights activist Haya bint Rashid Al Khalifa President of the United Nations General Assembly, only the third woman in history to head the world body. Female activist Ghada Jamsheer said "The government used women's rights as a decorative tool on the international level." She referred to the reforms as "artificial and marginal" and accused the government of "hinder[ing] non-governmental women societies". In 2006, Lateefa Al Gaood became the first female MP after winning by default. The number rose to four after the 2011 by-elections. In 2008, Houda Nonoo was appointed ambassador to the United States making her the first Jewish ambassador of any Arab country. In 2011, Alice Samaan, a Christian woman was appointed ambassador to the United Kingdom. Most domestic broadcasters are state-run. An independent commission, set up to look into the unrest, found that state media coverage was at times inflammatory. It said opposition groups suffered from lack of access to mainstream media, and recommended that the government "consider relaxing censorship". Bahrain will host the Saudi-financed Alarab News Channel, expected to launch in December 2012. It will be based at a planned "Media City". An opposition satellite station, Lualua TV, operates from London but has found its signals blocked. By June 2012, Bahrain had 961,000 internet users. The platform "provides a welcome free space for journalists, although one that is increasingly monitored", according to Reporters Without Borders. Rigorous filtering targets political, human rights, religious material and content deemed obscene. Bloggers and other netizens were among those detained during protests in 2011. The kingdom has a small but well equipped military called the Bahrain Defence Force (BDF), numbering around 13,000 personnel. The supreme commander of the Bahraini military is King Hamad bin Isa Al Khalifa and the deputy supreme commander is the Crown Prince, Salman bin Hamad bin Isa Al Khalifa. The BDF is primarily equipped with United States equipment, such as the F-16 Fighting Falcon, F-5 Freedom Fighter, UH-60 Blackhawk, M60A3 tanks, and the ex-USS Jack Williams, an Oliver Hazard Perry class frigate renamed the RBNS Sabha. The Government of Bahrain has close relations with the United States, having signed a cooperative agreement with the United States Military and has provided the United States a base in Juffair since the early 1990s, although a US naval presence existed since 1948. This is the home of the headquarters for Commander, United States Naval Forces Central Command (COMUSNAVCENT) / United States Fifth Fleet (COMFIFTHFLT), and around 6,000 United States military personnel. Bahrain participates in the Saudi Arabian-led intervention in Yemen against the Shia Houthis and forces loyal to former President Ali Abdullah Saleh, who was deposed in the 2011 Arab Spring uprising. Many civilians have died and large parts of the infrastructure in this region were destroyed. The permanent British Royal Navy base at Mina Salman, HMS Jufair, was officially opened in April 2018. Bahrain is the headquarters of the U.S. Navy's Fifth Fleet responsible for naval forces in the Persian Gulf. Bahrain established bilateral relations with 190 countries worldwide. As of 2012[update], Bahrain maintains a network of 25 embassies, 3 consulates and 4 permanent missions to the Arab League, United Nations and European Union respectively. Bahrain also hosts 36 embassies. Bahrain plays a modest, moderating role in regional politics and adheres to the views of the Arab League on Middle East peace and Palestinian rights by supporting the two state solution. Bahrain is also one of the founding members of the Gulf Cooperation Council. Relations with Iran tend to be tense as a result of a failed coup in 1981 which Bahrain blames Iran for and occasional claims of Iranian sovereignty over Bahrain by ultra-conservative elements in the Iranian public. Saudi Arabian troops were sent into Bahrain to crush a pro-democracy protests in 2011. The first municipality in Bahrain was the 8-member Manama municipality which was established in July 1919. Members of the municipality were elected annually; the municipality was said to have been the first municipality to be established in the Arab world. The municipality was in charge of cleaning roads and renting buildings to tenants and shops. By 1929, it undertook road expansions as well as opening markets and slaughterhouses. In 1958, the municipality started water purification projects. In 1960, Bahrain comprised four municipalities: Manama, Hidd, Al Muharraq, and Riffa. Over the next 30 years, the 4 municipalities were divided into 12 municipalities as settlements such as Hamad Town and Isa Town grew. These municipalities were administered from Manama under a central municipal council whose members are appointed by the king. 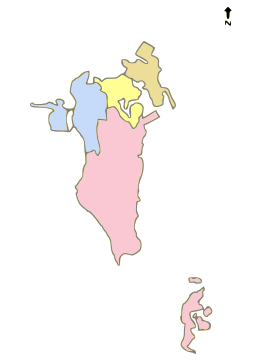 The Central Governorate was abolished in September 2014, its territory divided between the Northern Governorate, Southern Governorate, and Capital Governorate. The United States designated Bahrain a major non-NATO ally in 2001. As of October 2014[update], Bahrain is ruled by an "authoritarian regime" and is rated as "Not Free" by the U.S.-based non-governmental Freedom House. According to a January 2006 report by the United Nations Economic and Social Commission for Western Asia, Bahrain has the fastest-growing economy in the Arab world. Bahrain also has the freest economy in the Middle East and is twelfth-freest overall in the world based on the 2011 Index of Economic Freedom published by the Heritage Foundation/Wall Street Journal. In 2008, Bahrain was named the world's fastest-growing financial center by the City of London's Global Financial Centres Index. Bahrain's banking and financial services sector, particularly Islamic banking, have benefited from the regional boom driven by demand for oil. Petroleum production and processing is Bahrain's most exported product, accounting for 60% of export receipts, 70% of government revenues, and 11% of GDP. Aluminium production is the second-most exported product, followed by finance and construction materials. Economic conditions have fluctuated with the changing price of oil since 1985, for example during and following the Persian Gulf crisis of 1990–91. With its highly developed communication and transport facilities, Bahrain is home to a number of multinational firms and construction proceeds on several major industrial projects. A large share of exports consist of petroleum products made from imported crude oil, which accounted for 51% of the country's imports in 2007. Bahrain depends heavily on food imports to feed its growing population; it relies heavily on meat imports from Australia and also imports 75% of its total fruit consumption needs. Since only 2.9% of the country's land is arable, agriculture contributes to 0.5% of Bahrain's GDP. In 2004, Bahrain signed the Bahrain–US Free Trade Agreement, which will reduce certain trade barriers between the two nations. In 2011, due to the combination of the global financial crisis and the recent unrest, the gdp growth rate decreased to 1.3%, which was the lowest growth rate since 1994. Unemployment, especially among the young, and the depletion of both oil and underground water resources are major long-term economic problems. In 2008, the jobless figure was at 4%, with women over represented at 85% of the total. In 2007 Bahrain became the first Arab country to institute unemployment benefits as part of a series of labour reforms instigated under Minister of Labour, Dr. Majeed Al Alawi. As a tourist destination, Bahrain received over eight million visitors in 2008, though the exact number varies yearly. Most of these are from the surrounding Arab states although an increasing number hail from outside the region due to growing awareness of the kingdom's heritage and its higher profile as a result of the Bahrain International F1 Circuit. The kingdom combines modern Arab culture and the archaeological legacy of five thousand years of civilisation. The island is home to forts including Qalat Al Bahrain which has been listed by UNESCO as a World Heritage Site. The Bahrain National Museum has artefacts from the country's history dating back to the island's first human inhabitants some 9000 years ago and the Beit Al Quran (Arabic: بيت القرآن, meaning: the House of Qur'an) is a museum that holds Islamic artefacts of the Qur'an. Some of the popular historical tourist attractions in the kingdom are the Al Khamis Mosque, which is one of the oldest mosques in the region, the Arad fort in Muharraq, Barbar temple, which is an ancient temple from the Dilmunite period of Bahrain, as well as the A'ali Burial Mounds and the Saar temple. The Tree of Life, a 400-year-old tree that grows in the Sakhir desert with no nearby water, is also a popular tourist attraction. Bird watching (primarily in the Hawar Islands), scuba diving, and horse riding are popular tourist activities in Bahrain. Many tourists from nearby Saudi Arabia and across the region visit Manama primarily for the shopping malls in the capital Manama, such as the Bahrain City Centre and Seef Mall in the Seef district of Manama. The Manama Souq and Gold Souq in the old district of Manama are also popular with tourists. In January 2019 the state-run Bahrain News Agency announced the summer 2019 opening of an underwater theme park covering about 100,000 square meters with a sunken Boeing 747 as the site's centerpiece. The project is a partnership between the Supreme Council for Environment, Bahrain Tourism and Exhibitions Authority (BTEA), and private investors. Bahrain hopes scuba divers from around the world will visit the underwater park, which will also include artificial coral reefs, a copy of a Bahraini pearl merchant's house, and sculptures. The park is intended to become the world's largest eco-friendly underwater theme park. Since 2005, Bahrain hosts an annual festival in March, titled Spring of Culture, which features internationally renowned musicians and artists performing in concerts. Manama was named the Arab Capital of Culture for 2012 and Capital of Arab Tourism for 2013 by the Arab League. The 2012 festival featured concerts starring Andrea Bocelli, Julio Iglesias and other musicians. Bahrain has one main international airport, the Bahrain International Airport (BIA) which is located on the island of Muharraq, in the north-east. The airport handled more than 100,000 flights and more than 8 million passengers in 2010. Bahrain's national carrier, Gulf Air operates and bases itself in the BIA. Bahrain has a well-developed road network, particularly in Manama. The discovery of oil in the early 1930s accelerated the creation of multiple roads and highways in Bahrain, connecting several isolated villages, such as Budaiya, to Manama. To the east, a bridge connected Manama to Muharraq since 1929, a new causeway was built in 1941 which replaced the old wooden bridge. Currently there are three modern bridges connecting the two locations. Transits between the two islands peaked after the construction of the Bahrain International Airport in 1932. Ring roads and highways were later built to connect Manama to the villages of the Northern Governorate and towards towns in central and southern Bahrain. The four main islands and all the towns and villages are linked by well-constructed roads. There were 3,164 km (1,966 mi) of roadways in 2002, of which 2,433 km (1,512 mi) were paved. A causeway stretching over 2.8 km (2 mi), connect Manama with Muharraq Island, and another bridge joins Sitra to the main island. The King Fahd Causeway, measuring 24 km (15 mi), links Bahrain with the Saudi Arabian mainland via the island of Umm an-Nasan. It was completed in December 1986, and financed by Saudi Arabia. In 2008, there were 17,743,495 passengers transiting through the causeway. Bahrain's port of Mina Salman is the main seaport of the country and consists of 15 berths. In 2001, Bahrain had a merchant fleet of eight ships of 1,000 GT or over, totaling 270,784 GT. Private vehicles and taxis are the primary means of transportation in the city. The telecommunications sector in Bahrain officially started in 1981 with the establishment of Bahrain's first telecommunications company, Batelco and until 2004, it monopolised the sector. In 1981, there were more than 45,000 telephones in use in the country. By 1999, Batelco had more than 100,000 mobile contracts. In 2002, under pressure from international bodies, Bahrain implemented its telecommunications law which included the establishment of an independent Telecommunications Regulatory Authority (TRA). In 2004, Zain (a rebranded version of MTC Vodafone) started operations in Bahrain and in 2010 VIVA (owned by STC Group) became the third company to provide mobile services. Bahrain has been connected to the internet since 1995 with the country's domain suffix is '.bh'. The country's connectivity score (a statistic which measures both Internet access and fixed and mobile telephone lines) is 210.4 percent per person, while the regional average in Arab States of the Persian Gulf is 135.37 percent. The number of Bahraini internet users has risen from 40,000 in 2000 to 250,000 in 2008, or from 5.95 to 33 percent of the population. As of August 2013[update], the TRA has licensed 22 Internet Service Providers. In 2010, Bahrain's population grew to 1.2 million, of which 568,399 were Bahraini and 666,172 were non-nationals. It had risen from 1.05 million (517,368 non-nationals) in 2007, the year when Bahrain's population crossed the one million mark. Though a majority of the population is Middle Eastern, a sizeable number of people from South Asia live in the country. In 2008, approximately 290,000 Indian nationals lived in Bahrain, making them the single largest expatriate community in the country. Bahrain is the fourth most densely populated sovereign state in the world with a population density of 1,646 people per km2 in 2010. The only sovereign states with larger population densities are city states. Much of this population is concentrated in the north of the country with the Southern Governorate being the least densely populated part. The north of the country is so urbanised that it is considered by some to be one large metropolitan area. Sunni Bahrainis are mainly divided into two main ethnic groups: Arabs (al Arab) and Huwala. Sunni Arabs are the most influential ethnic group in Bahrain, they hold most government positions and the Bahraini monarchy are Sunni Arabs. Sunni Arabs have traditionally lived in areas such as Zallaq, Muharraq, Riffa and Hawar islands. The Huwala are descendants of Sunni Iranians; some of them are Sunni Persians, while others Sunni Arabs. There are also Sunnis of Baloch origin. Most African Bahrainis come from East Africa and have traditionally lived in Muharraq Island and Riffa. The state religion of Bahrain is Islam and most Bahraini citizens are Muslim. The majority of Bahraini Muslims are Shiites. It is one of three countries in the Middle East in which Shiites are the majority, the other two being Iraq and Iran. Public surveys are rare in Bahrain, but a 2017 national survey found that 62 percent of Bahrainis were Shia and 38 percent were Sunni, which is consistent with most estimates. Although the majority of the country's citizens are Shia, the royal family and most Bahrani elites are Sunni. The country's two Muslim communities are united on some issues, but disagree sharply on others. Shia have often complained of being politically repressed and economically marginalized in Bahrain; as a result, most of the protestors in the Bahraini uprising of 2011 were Shia. There is a native Christian community in Bahrain. Non-Muslim Bahraini residents numbered 367,683 per the 2010 census, most of whom are Christians. Expatriate Christians make up the majority of Christians in Bahrain, while native Christian Bahrainis (who hold Bahraini citizenship) make up a smaller community. Alees Samaan, a former Bahraini ambassador to the United Kingdom is a native Christian. Bahrain also has a native Jewish community numbering thirty-seven Bahraini citizens. Various sources cite Bahrain's native Jewish community as being from 36 to 50 people. Due to an influx of immigrants and guest workers from Asian countries, such as India, the Philippines and Sri Lanka, the overall percentage of Muslims in the country has declined in recent years. According to the 2001 census, 81.2% of Bahrain's population was Muslim, 10% were Christian, and 9.8% practised Hinduism or other religions. The 2010 census records that the Muslim proportion had fallen to 70.2% (the 2010 census did not differentiate between the non-Muslim religions). 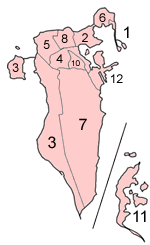 Baha'is constitute approximately 1% of Bahrain's total population. Arabic is the official language of Bahrain, though English is widely used. Bahrani Arabic is the most widely spoken dialect of the Arabic language, though it differs widely from standard Arabic, like all Arabic dialects. Arabic plays an important role in political life, as, according to article 57 (c) of Bahrain's constitution, an MP must be fluent in Arabic to stand for parliament. Among the Bahraini and non-Bahraini population, many people speak Persian, the official language of Iran, or Urdu, an official language in Pakistan and a regional language in India. Nepali is also widely spoken in the Nepalese workers and Gurkha Soldiers community. Malayalam, Tamil and Hindi are spoken among significant Indian communities. All commercial institutions and road signs are bilingual, displaying both English and Arabic. Education is compulsory for children between the ages of 6 and 14. Education is free for Bahraini citizens in public schools, with the Bahraini Ministry of Education providing free textbooks. Coeducation is not used in public schools, with boys and girls segregated into separate schools. At the beginning of the 20th century, Qur'anic schools (Kuttab) were the only form of education in Bahrain. They were traditional schools aimed at teaching children and youth the reading of the Qur'an. After World War I, Bahrain became open to western influences, and a demand for modern educational institutions appeared. 1919 marked the beginning of modern public school system in Bahrain when the Al-Hidaya Al-Khalifia School for boys opened in Muharraq. In 1926, the Education Committee opened the second public school for boys in Manama, and in 1928 the first public school for girls was opened in Muharraq. As of 2011[update], there are a total of 126,981 students studying in public schools. In 2004, King Hamad ibn Isa Al Khalifa introduced the "King Hamad Schools of Future" project that uses Information Communication Technology to support K–12 education in Bahrain. The project's objective is to connect all schools within the kingdom with the Internet. In addition to British intermediate schools, the island is served by the Bahrain School (BS). The BS is a United States Department of Defense school that provides a K-12 curriculum including International Baccalaureate offerings. There are also private schools that offer either the IB Diploma Programme or United Kingdom's A-Levels. Bahrain also encourages institutions of higher learning, drawing on expatriate talent and the increasing pool of Bahrain nationals returning from abroad with advanced degrees. The University of Bahrain was established for standard undergraduate and graduate study, and the King Abdulaziz University College of Health Sciences, operating under the direction of the Ministry of Health, trains physicians, nurses, pharmacists and paramedics. The 2001 National Action Charter paved the way for the formation of private universities such as the Ahlia University in Manama and University College of Bahrain in Saar. The Royal University for Women (RUW), established in 2005, was the first private, purpose-built, international university in Bahrain dedicated solely to educating women. The University of London External has appointed MCG (Management Consultancy Group) as the regional representative office in Bahrain for distance learning programmes. MCG is one of the oldest private institutes in the country. Institutes have also opened which educate South Asian students, such as the Pakistan Urdu School, Bahrain and the Indian School, Bahrain. A few prominent institutions are DePaul University, Bentley University, the Ernst & Young Training Institute, New York Institute of Technology and the Birla Institute of Technology International Centre. In 2004, the Royal College of Surgeons in Ireland (RCSI) set up a constituent medical university in the country. In addition to the Arabian Gulf University, AMA International University and the College of Health Sciences, these are the only medical schools in Bahrain. Bahrain has a universal health care system, dating back to 1960. Government-provided health care is free to Bahraini citizens and heavily subsidised for non-Bahrainis. Healthcare expenditure accounted for 4.5% of Bahrain's GDP, according to the World Health Organization. Bahraini physicians and nurses form a majority of the country's workforce in the health sector, unlike neighbouring Gulf states. The first hospital in Bahrain was the American Mission Hospital, which opened in 1893 as a dispensary. The first public hospital, and also tertiary hospital, to open in Bahrain was the Salmaniya Medical Complex, in the Salmaniya district of Manama, in 1957. Private hospitals are also present throughout the country, such as the International Hospital of Bahrain. The life expectancy in Bahrain is 73 for males and 76 for females. Compared to many countries in the region, the prevalence of AIDS and HIV is relatively low. Malaria and tuberculosis (TB) do not constitute major problems in Bahrain as neither disease is indigenous to the country. As a result, cases of malaria and TB have declined in recent decades with cases of contractions amongst Bahraini nationals becoming rare. The Ministry of Health sponsors regular vaccination campaigns against TB and other diseases such as hepatitis B.
Bahrain is currently suffering from an obesity epidemic as 28.9% of all males and 38.2% of all females are classified as obese. Bahrain also has one of the highest prevalence of diabetes in the world (5th place), with more than 15% of the Bahraini population suffering from the disease, and accounting for 5% of deaths in the country. Cardiovascular diseases account for 32% of all deaths in Bahrain, being the number one cause of death in the country (the second being cancer). Sickle-cell anaemia and thalassaemia are prevalent in the country, with a study concluding that 18% of Bahrainis are carriers of sickle-cell anaemia while 24% are carriers of thalassaemia. Islam is the main religion, and Bahrainis are known for their tolerance towards the practice of other faiths. Intermarriages between Bahrainis and expatriates are not uncommon—there are many Filipino-Bahrainis like Filipino child actress Mona Marbella Al-Alawi. A wind tower in Bahrain. The modern art movement in the country officially emerged in the 1950s, culminating in the establishment of an art society. Expressionism and surrealism, as well as calligraphic art are the popular forms of art in the country. Abstract expressionism has gained popularity in recent decades. Pottery-making and textile-weaving are also popular products that were widely made in Bahraini villages. Arabic calligraphy grew in popularity as the Bahraini government was an active patron in Islamic art, culminating in the establishment of an Islamic museum, Beit Al Quran. The Bahrain national museum houses a permanent contemporary art exhibition. The architecture of Bahrain is similar to that of its neighbours in the Persian Gulf. The wind tower, which generates natural ventilation in a house, is a common sight on old buildings, particularly in the old districts of Manama and Muharraq. Literature retains a strong tradition in the country; most traditional writers and poets write in the classical Arabic style. In recent years, the number of younger poets influenced by western literature are rising, most writing in free verse and often including political or personal content. Ali Al Shargawi, a decorated longtime poet, was described in 2011 by Al Shorfa as the literary icon of Bahrain. In literature, Bahrain was the site of the ancient land of Dilmun mentioned in the Epic of Gilgamesh. Legend also states that it was the location of the Garden of Eden. The music style in Bahrain is similar to that of its neighbors. The Khaliji style of music, which is folk music, is popular in the country. The sawt style of music, which involves a complex form of urban music, performed by an Oud (plucked lute), a violin and mirwas (a drum), is also popular in Bahrain. Ali Bahar was one of the most famous singers in Bahrain. He performed his music with his Band Al-Ekhwa (The Brothers). Bahrain was also the site of the first recording studio amongst the Persian Gulf states. Bahrain is the first nation other than United States of America to host International Mixed Martial Arts Federation World Championships of Amateur MMA. Bahrain have recorded an influx in global athletes visiting the nation for Mixed Martial Arts training during 2017. Association football is the most popular sport in Bahrain. Bahrain's national football team has competed multiple times at the Asian Cup, Arab Nations Cup and played in the FIFA World Cup qualifiers, though it has never qualified for the World Cup. Bahrain has its own top-tier domestic professional football league, the Bahraini Premier League. Basketball, rugby and horse racing are also widely popular in the country. The government of Bahrain also sponsors a UCI WorldTeam cycling team, Bahrain–Merida, which participated in the 2017 Tour de France. Brave Combat Federation is a Bahrain-based Mixed Martial Arts promotion which has hosted events in Bahrain, United Arab Emirates, Brazil, Kazakhstan, and India. Bahrain MMA Federation (BMMAF) has been set up under the patronage of Sheikh Khalid bin Hamad Al Khalifa and the jurisdiction of the Sports Minister, Sheikh Nasser bin Hamad Al Khalifa. The development of MMA in the nation is convened through KHK MMA, which owns Brave Combat Federation which is the largest Mixed Martial Arts promotion in the Middle East. Bahrain will be hosting Amateur World Championships 2017 in association with International Mixed Martial Arts Federation. Bahrain will be the first Asian and Arab country to host the amateur MMA championship. Bahrain has a Formula One race-track, which hosted the inaugural Gulf Air Bahrain Grand Prix on 4 April 2004, the first in an Arab country. This was followed by the Bahrain Grand Prix in 2005. Bahrain hosted the opening Grand Prix of the 2006 season on 12 March of that year. Both the above races were won by Fernando Alonso of Renault. The race has since been hosted annually, except for 2011 when it was cancelled due to ongoing anti-government protests. The 2012 race occurred despite concerns of the safety of the teams and the ongoing protests in the country. The decision to hold the race despite ongoing protests and violence has been described as "controversial" by Al Jazeera English, CNN, AFP and Sky News. The Independent named it "one of the most controversial in the history of the sport". In 2006, Bahrain also hosted its inaugural Australian V8 Supercar event dubbed the "Desert 400". The V8s returned every November to the Sakhir circuit until 2010, in which it was the second event of the series. The series has not returned since. The Bahrain International Circuit also features a full-length dragstrip where the Bahrain Drag Racing Club has organised invitational events featuring some of Europe's top drag racing teams to try to raise the profile of the sport in the Middle East. 1 January New Year's Day رأس السنة الميلادية The Gregorian New Year's Day. 1 May Labour Day يوم العمال Locally called "Eid Al Oumal" (Workers' Day). 16 December National Day اليوم الوطني National Day of Bahrain. 1st Muharram Islamic New Year رأس السنة الهجرية Islamic New Year (also known as: Hijri New Year). 9th, 10th Muharram Day of Ashura عاشوراء Represented on the 9th and 10th day of the Hijri month of Muharram. Coincided with the memory of the martyrdom of Imam Hussein. 12th Rabiul Awwal Prophet Muhammad's birthday المولد النبوي Commemorates Prophet Muhammad's birthday, celebrated in most parts of the Muslim world. 1st, 2nd, and 3rd Shawwal Little Feast عيد الفطر Commemorates the end of Ramadan. 9th Zulhijjah Arafat Day يوم عرفة Commemoration of Muhammad's final sermon and completion of the message of Islam. 10th, 11th, 12th, and 13th Zulhijjah Feast of the Sacrifice عيد الأضحى Commemorates Ibrahim's willingness to sacrifice his son. Also known as the Big Feast (celebrated from the 10th to 13th). ^ a b c d e f "CIA World Factbook, "Bahrain"". Cia.gov. Archived from the original on 29 December 2010. Retrieved 25 January 2011. ^ "Bahrain ends special pact". The Straits Times. 15 August 1971. ^ "Bahraini Census 2010 – تعداد السكــان العام للبحريــن 2010". Archived from the original on 20 March 2012. Retrieved 31 January 2012. ^ a b c d "World Economic Outlook Database, October 2018". IMF.org. International Monetary Fund. Retrieved 12 March 2019. ^ a b c d e f "General Tables". Bahraini Census 2010. Archived from the original on 20 March 2012. Retrieved 3 March 2012. ^ Oman: The Lost Land Archived 6 October 2014 at the Wayback Machine. Saudi Aramco World. Retrieved on 7 November 2016. ^ a b c EB (1878). ^ CNN Wire Staff (1 November 2012). "Bahrain says ban on protests in response to rising violence". CNN. Retrieved 16 November 2012. ^ "How Bahrain uses sport to whitewash a legacy of torture and human rights abuses | David Conn | Sport". The Guardian. Retrieved 19 July 2018. ^ "PressTV-Bahrain king enacts election ban on opposition figures". Presstv.com. 12 June 2018. Retrieved 19 July 2018. ^ "Bahrain: Reform-Promise and Reality" (PDF). J.E. Peterson. p. 157. ^ "Bahrain's economy praised for diversity and sustainability". Bahrain Economic Development Board. Archived from the original on 28 December 2010. Retrieved 24 June 2012. ^ a b Houtsma, M. Th. (1960). "Baḥrayn". Encyclopedia of Islam. I. Leiden: E.J. Brill. p. 941. ^ Room, Adrian (2006). Placenames of the World: Origins and Meanings of the Names for 6,600 Countries, Cities, Territories, Natural Features, and Historic Sites. McFarland. ISBN 978-0-7864-2248-7. ^ First encyclopaedia of Islam 1913–1936. E.J. Brill. 1993. p. 584. ISBN 978-90-04-09796-4. ^ Rice, Michael (1994). The Archaeology of the Arabian Gulf, c. 5000–323 BC. Routledge. ISBN 0-415-03268-7. ^ "Dialect, Culture, and Society in Eastern Arabia: Glossary". Clive Holes. 2001. pp. XIX. ^ a b EB (1911). ^ "Qal'at al-Bahrain – Ancient Harbour and Capital of Dilmun". UNESCO. Retrieved 5 October 2012. ^ Larsen, Curtis E. (1984). Life and Land Use on the Bahrain Islands: The Geoarchaeology of an Ancient Society. University of Chicago Press. pp. 52–55. ISBN 978-0-226-46906-5. ^ a b Larsen 1983, p. 13. ^ Ju. B. Tsirkin. "Canaan. Phoenicia. Sidon" (PDF). p. 274. ^ R. A. Donkin. Beyond Price: Pearls and Pearl-fishing: Origins to the Age of Discoveries, Volume 224. p. 48. ^ Michael Rice. Bahrain Through The Ages – Archa. pp. 401–402. ^ Hoyland, Robert G. (2001). Arabia and the Arabs: From the Bronze Age to the Coming of Islam. Routledge. p. 28. ISBN 978-0-415-19535-5. ^ "Social and political change in Bahrain since the First World War" (PDF). Durham University. 1973. pp. 46–47. ^ a b "Dialect, Culture, and Society in Eastern Arabia: Glossary". Clive Holes. 2001. pp. XXIV–XXVI. Thus the pre-Islamic ethno-linguistic situation in eastern Arabia appear to have been a mixed tribal population of partially Christianised Arabs of diverse origins who probably spoke different old Arabian vernaculars; a mobile Persian-speaking population, possibly of traders and administrators, with strong links to Persia, with which they maintained close contact; a sedentary, non-tribal community of Aramaic-speaking farmers; a Persian clergy, which we know for certain, used Syriac as a language of liturgy and general writing, probably alongside Persian as a spoken language. ^ a b J. R. Smart (2013). "Tradition and Modernity in Arabic Language And Literature". ^ "E.J. Brill's First Encyclopaedia of Islam, 1913–1936, Volume 5". M. Th. Houtsma. 1993. p. 98. ^ Serjeant, Robert Bertram (1968). "Fisher-folk and fish-traps in al-Bahrain". Bulletin of the School of Oriental and African Studies, University of London. 31 (3): 486–514 (488). doi:10.1017/s0041977x00125522. JSTOR 614301. ^ "The letters of the Prophet Muhammed beyond Arabia" (PDF). Archived from the original (PDF) on 6 December 2010. Retrieved 18 June 2012. ^ "Qarmatiyyah". Overview of World Religions. St. Martin's College. Archived from the original on 28 April 2007. Retrieved 4 May 2007. ^ "Black Stone of Mecca". Encyclopædia Britannica. 2007. Encyclopædia Britannica Online. 25 June 2007. ^ Cole, Juan (2002). Sacred Space And Holy War: The Politics, Culture and History of Shi'ite Islam. I. B. Tauris. ISBN 978-1-86064-736-9. ^ a b McCoy, Eric Andrew (2008). Iranians in Bahrain and the United Arab Emirates: Migration, Minorities, and Identities in the Persian Gulf Arab States. ProQuest. p. 73. ISBN 978-0-549-93507-0. ^ Slot, B. (1991). The Origins of Kuwait. BRILL. p. 110. ISBN 978-90-04-09409-3. ^ Rihani, Ameen Fares (1930). Around the coasts of Arabia. Houghton Mifflin Company. p. 297. ^ Background Notes: Mideast, March, 2011. US State Department. 2011. ISBN 1-59243-126-7. ^ "'Gazetteer of the Persian Gulf. Vol I. Historical. Part IA & IB. J G Lorimer. 1915'  (1155/1782)". qdl.qa. p. 1000. Retrieved 16 January 2015. ^ Onley, James (2007). "Chapter 1, (2.7)". The Arabian Frontier of the British Raj. Merchants, Rulers and British in the Nineteenth-Century Gulf. Oxford: Oxford University Press. ISBN 9780199228102. ^ Al-Baharna, Husain (1968). Legal Status of the Arabian Gulf States: A Study of Their Treaty Relations and Their International Problems. Manchester University Press. p. 31. ISBN 0-7190-0332-6. ^ a b Smart, J. R.; Smith, G. Rex; Pridham, B. R. (2004). New Arabian Studies. University of Exeter Press. pp. 51, 52, 53, 67, 68. ISBN 978-0-85989-706-8. ^ Pridham, B. R.; University of Exeter. Centre for Arab Gulf Studies (1985). The Arab Gulf and the West. Taylor & Francis. p. 7. ISBN 978-0-7099-4011-1. ^ a b c Wilson, Arnold T. (2011). The Persian Gulf: A historical sketch from the earliest times to the beginning of the twentieth century. Routledge. ISBN 978-1-136-84105-7. ^ a b c Mojtahed-Zadeh & 1999, p. 130. ^ The old Qaṣr es-Sheikh (click on photo to enlarge). ^ Kinninmont, Jane (28 February 2011). "Bahrain's Re-Reform Movement". Foreign Affairs. Retrieved 7 July 2012. ^ a b Abedin, Mahan (9 December 2004). "All at sea over 'the Gulf'". Asia Times Online. Retrieved 7 July 2012. ^ "Near & Middle East Titles: Bahrain Government Annual Reports 1924–1970". Cambridge Archives Editions. Archived from the original on 3 October 2012. Retrieved 2 October 2012. ^ "Bahrain Education". looklex.com. Archived from the original on 3 October 2012. Retrieved 17 June 2012. ^ "Bahrain:"How was separated from Iran" ?". Iran Chamber Society. Retrieved 17 June 2012. Based on extracts from Mojtahedzadeh, Piruz (1995). "Bahrain: the land of political movements". Rahavard, a Persian Journal of Iranian Studies. XI (39). ^ Yergin, Daniel (13 January 1991). "The Incessant Lure of Kuwait's Oil". The New York Times. Retrieved 5 October 2012. ^ Mulligan, William E. (July–August 1976). "Air Raid! A Sequel". Saudi Aramco World. Archived from the original on 3 October 2012. Retrieved 2 October 2012. ^ a b Ratzlav-Katz, Nissan (14 August 2008). "The King of Bahrain Wants the Jews Back". Israel National News. Archived from the original on 3 October 2012. Retrieved 2 October 2012. ^ a b Curtis, Adam (11 May 2012). "If you take my advice – I'd repress them". BBC News. Retrieved 27 June 2012. ^ nationsonline.org, klaus kästle -. 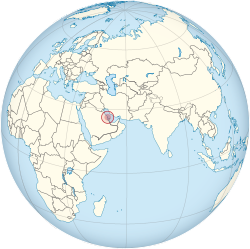 "Bahrain – Kingdom of Bahrain – Country Profile – Al Bahrayn – Persian Gulf". ^ "Country independence dates". didyouknow.org. ^ The Middle East and North Africa 2004. Routledge. 2003. p. 225. ISBN 1-85743-184-7. ^ Talbott, Strobe (25 October 1982). "Gulf States: Stay Just on the Horizon, Please". Time. Archived from the original on 3 October 2012. Retrieved 2 October 2012. ^ Darwish, Adel (1 March 1999). "Bahrain remains stable despite arson attacks that took place in the country". The Middle East. Retrieved 5 October 2012 – via Questia Online Library. ^ "The Rich/Poor & Sunni/Shiite Rift". APS Diplomat. – via HighBeam Research (subscription required). 18 March 2002. Archived from the original on 17 January 2013. Retrieved 5 October 2012. ^ Darwish, Adel (March 1999). "Rebellion in Bahrain". Middle East Review of International Affairs. 3 (1). Archived from the original on 3 October 2012. Retrieved 2 October 2012. ^ Malik, Adnan (14 December 2002). "Bahrain's monarch opens parliament after a span of nearly 30 years". Associated Press (via HighBeam Research). Archived from the original on 4 October 2012. ^ a b "Bahrain: Promising human rights reform must continue" (PDF). Amnesty International. 13 March 2001. Retrieved 9 February 2011. ^ "Country Theme: Elections: Bahrain". UNDP-Programme on Governance in the Arab Region. 2011. Archived from the original on 10 May 2011. Retrieved 9 February 2011. ^ "The Kingdom of Bahrain: The Constitutional Changes". The Estimate: Political and Security Analysis of the Islamic World and its Neighbors. 22 February 2002. Archived from the original on 3 October 2009. Retrieved 17 February 2011. ^ a b c The Middle East and North Africa 2004. Europa Publications. 2003. p. 232. ISBN 1-85743-184-7. ^ "To Implement the United States-Bahrain Free Trade Agreement, and for Other Purposes". White House Archives. Retrieved 23 June 2012. ^ "Bahrain declares state of emergency after unrest". Reuters. 15 March 2011. Archived from the original on 3 October 2012. Retrieved 3 October 2012. ^ a b c d e "Report of the Bahrain Independent Commission of Inquiry". BICI. ^ Law, Bill (6 April 2011). "Police Brutality Turns Bahrain Into 'Island of Fear'". Crossing Continents (via BBC News). Retrieved 15 April 2011. ^ Press release (30 March 2011). "USA Emphatic Support to Saudi Arabia". Zayd Alisa (via Scoop). Retrieved 15 April 2011. ^ Cockburn, Patrick (18 March 2011). "The Footage That Reveals the Brutal Truth About Bahrain's Crackdown – Seven Protest Leaders Arrested as Video Clip Highlights Regime's Ruthless Grip on Power". The Independent. Retrieved 15 April 2011. ^ "Bahrain inquiry confirms rights abuses". Al Jazeera English. 23 November 2011. Archived from the original on 3 October 2012. Retrieved 19 June 2012. ^ "Applying pressure on Bahrain". The Washington Post. 10 May 2011. Archived from the original on 3 October 2012. Retrieved 7 July 2012. ^ Carlstrom, Gregg (23 April 2012). "Bahrain court delays ruling in activists case". Al Jazeera English. Retrieved 14 June 2012. ^ Solomon, Erika (11 June 2011). "Thousands rally for reform in Bahrain". Reuters. Archived from the original on 3 October 2012. ^ "Bahrain protesters join anti-government march in Manama". BBC News. 9 March 2012. Archived from the original on 3 October 2012. Retrieved 3 October 2012. ^ "Mass pro-democracy protest rocks Bahrain". Reuters. 9 March 2012. Archived from the original on 3 October 2012. ^ "Bahrain live blog 25 Jan 2012". Al Jazeera. 25 January 2012. Retrieved 17 February 2012. ^ "Heavy police presence blocks Bahrain protests". Al Jazeera. 15 February 2012. Archived from the original on 3 October 2012. Retrieved 17 February 2012. ^ "Bomb blast kills three Bahrain policemen". BBC. 3 March 2014. Retrieved 6 March 2014. ^ "Tear Gas or Lethal Gas? Bahrain's Death Toll Mounts to 34". Physicians for Human Rights. 6 March 2012. Retrieved 12 January 2018. ^ Bahrain Watch (31 July 2013). "UK's relations with Saudi Arabia and Bahrain (further written evidence)". Foreign Affairs Select Committee. Retrieved 12 January 2018. ^ Hammond, Andrew (14 April 2011). "Gulf media find their red line in uprisings:Bahrain". Reuters Africa. Retrieved 26 April 2013. ^ Mekhennet, Souad (1 April 2017). "U.S. increasingly sees Iran's hand in the arming of Bahraini militants". The Washington Post. Retrieved 19 July 2018. ^ "Bahrain Geography and Population". countrystudies.us. Archived from the original on 23 September 2006. Retrieved 29 June 2012. ^ Kingdom of Bahrain National Report (PDF) (Report). International Hydrographic Organization. 2013. p. 1. Retrieved 11 June 2013. ^ Abdulla, Mohammed Ahmed; Zain al-'Abdeen, Bashir (2009). تاريخ البحرين الحديث (1500–2002) [Modern History of Bahrain (1500–2002)]. Bahrain: Historical Studies Centre, University of Bahrain. pp. 26, 29, 59. ISBN 978-99901-06-75-6. ^ a b The Report: Bahrain 2010. Oxford Business Group. pp. 12–25. ISBN 978-1-907065-22-4. ^ Alsharhan, A. S. (2001). Hydrogeology of an Arid Region: The Arabian Gulf and Adjoining Areas. Elsevier. pp. 188–190. ISBN 978-0-444-50225-4. ^ Martin-King, Philippa (June 2011). "Intelligent buildings". International Electrotechnical Commission. Retrieved 5 July 2012. ^ "Bahrain Weather". Bahrain Weather. Archived from the original on 3 October 2012. Retrieved 25 June 2012. ^ "World Weather Information Service – Bahrain/Manama". World Meteorological Organization. 23 July 2012. ^ a b c d e f g h Towards a Bahrain National Report to the Convention on Biological Diversity (PDF). Fuller & Associates. 2005. pp. 22, 23, 28. Archived from the original (PDF) on 17 January 2013. ^ a b "Country profile: Bahrain". Convention on Biological Diversity. Retrieved 24 June 2012. ^ "Bahrain News — The Protests". New York Times. 24 June 2012. Retrieved 2 July 2012. ^ "Bahrain Shia demand cabinet change". Al Jazeera English. 5 March 2010. Retrieved 4 July 2012. ^ "Bahrain". International Foundation for Electoral Systems. 26 July 2010. Retrieved 22 March 2011. ^ "Bahrain – News Archive". Election Guide. 24 September 2011. Retrieved 2 July 2012. ^ "Bahrain holds vote to fill seats vacated during unrest". Al-Ahram/Thomson Reuters. 24 September 2011. Archived from the original on 24 September 2011. Retrieved 24 September 2011. ^ Bronner, Ethan (24 September 2011). "Bahrain Vote Erupts in Violence". The New York Times. Archived from the original on 24 September 2011. Retrieved 24 September 2011. ^ Krane, Jim (26 November 2006). "Islamists Dominate Bahrain Elections". Washington Post. Archived from the original on 3 October 2012. Retrieved 17 June 2012. ^ Hamada, Suad (5 June 2009). "Religion: New Family Law for Sunni Women in Bahrain Not for Shiites". Inter Press Service. Retrieved 5 July 2012. ^ Human Rights Without Frontiers (28 October 2011). Which Future For Bahrain? (PDF) (Report). International Center for Law and Religion Studies. pp. 8–9. Retrieved 5 July 2012. ^ MacLeod, Scott (14 May 2006). "Ghada Jamsheer: Activist". Time. Retrieved 5 July 2012. ^ a b Jamsheer, Ghada (18 December 2006). "Women in Bahrain and the Struggle Against Artificial Reforms". Women Living Under Muslim Laws. Retrieved 5 July 2012. ^ "Islamist Terrorism and Democracy in the Middle East". The New Republic. Retrieved 17 June 2012. ^ "Bahrain Sa'id 'Abd al-Rasul al-Iskafi". Amnesty International. 27 September 1995. Retrieved 2 February 2012. ^ "Routine abuse, routine denial". Human Rights Watch. 1 June 1997. Retrieved 2 February 2012. ^ "Country Reports on Human Rights Practices". United States Department of State. 4 March 2002. Retrieved 5 July 2012. ^ "World Report 2011: Bahrain". Human Rights Watch. 2011. Retrieved 5 October 2012. ^ "Freedom in Bahrain 2011". Freedom House. 2011. Retrieved 29 January 2012. ^ Freedom of the Net 2011 – Bahrain part (PDF) (Report). Freedom House. 2011. ^ "RWB Press Freedom Index 2002". Reporters Without Borders. 2002. Retrieved 29 January 2012. ^ "RWB Press Freedom Index 2010". Reporters Without Borders. 2010. Retrieved 29 January 2012. ^ "FH Press Freedom Index 2011". Freedom House. 2011. Retrieved 29 January 2012. ^ Elizabeth Dickinson (23 November 2011). "Bahrain commission issues brutal critique of Arab Spring crackdown". The Christian Science Monitor. Retrieved 5 July 2012. ^ Payne, Ed (17 April 2012). "Amnesty report: Bahrain reforms are 'flawed,' 'inadequate'". CNN. Retrieved 7 July 2012. ^ "Bahrain police 'continue to torture detainees'". BBC. 29 April 2012. Retrieved 5 July 2012. ^ Gordts, Eline (5 August 2011). "Shouting In The Dark: Al Jazeera Bahrain Documentary Shows The Bloody Fight For Democracy". The Huffington Post. Retrieved 15 August 2011. ^ AJStream (8 August 2011). "The Stream – Bahrain Foreign Minister Criticizes Al Jazeera Documentary on Twitter". Retrieved 15 August 2011. ^ "Saudi Arabia, UAE and Bahrain end rift with Qatar, return ambassadors". Reuters. 16 November 2014. Retrieved 16 November 2014. ^ European Parliament adopts resolution condemning Bahrain's human rights abuses. Indexoncensorship.org. Retrieved on 7 November 2016. ^ "Bahrain must stop discriminating against Shias: Tillerson". Shiite News. Retrieved 18 August 2017. ^ "Bahrain must stop discriminating against Shias: Tillerson". Muslim Times. Muslim Times. Retrieved 18 August 2017. ^ The New Arab (5 December 2014). "US approves huge arms sale to Bahrain despite human rights concer". Alaraby.co.uk. Retrieved 19 July 2018. ^ "Document | Amnesty International". Amnesty.org. 7 September 2017. Retrieved 19 July 2018. ^ "Bahrain: Government expels citizens after having revoked their nationality | Amnesty International". Amnesty.org. Retrieved 19 July 2018. ^ "Bahrain Activist Gets 5-Year Sentence for 'Insulting' Tweets". The New York Times. 21 February 2018. ^ "Britain Trained a Bahraini Police Chief Who Presided Over Abuse of Political Dissidents - VICE". www.vice.com. ^ Ungoed-Thomas, Jon (5 February 2017). "Britain helps train 'violent' Bahraini police" – via www.thetimes.co.uk. the fund was used to pay for Bahrain's chief of police, Tariq al-Hassan, and other senior officers to travel to Belfast to learn how police in Northern Ireland deal with public protests. ^ MacFarquhar, Neil (22 May 2002). "In Bahrain, Women Run, Women Vote, Women Lose". The New York Times. Retrieved 7 July 2012. ^ Darwish, Adel (26 October 2002). "Islamists gain majority in Bahrain". The Telegraph. London. Retrieved 5 October 2012. ^ Toumi, Habib (27 November 2006). "Women fail to add to the seat won unopposed". Gulf News. Retrieved 4 July 2012. ^ Toumi, Habib (8 October 2011). "Bahrain women MPs set to make a difference as parliament reconvenes". Gulf News. Retrieved 4 July 2012. ^ "Bahrain names Jewish ambassador". BBC News. 29 May 2008. Retrieved 4 July 2012. ^ Toumi, Habib (27 May 2012). "Bahrain urges greater global religious tolerance". Gulf News. Retrieved 4 July 2012. ^ a b c "Bahrain profile". BBC News. 29 January 2013. ^ "Bahrain profile – Media". BBC News. Retrieved 15 June 2014. ^ "Bahrain". The 2011 US Department of State Background Notes. United States Department of State. Retrieved 2 March 2012. The Bahrain Defense Force (BDF) numbers about 13,000 personnel. ^ "Crown Prince Biography". Ministry of Foreign Affairs, Bahrain. Retrieved 27 June 2012. ^ "HRH Prince Salman Exchanges Letters With BDF Chief Commander". Bahrain News Agency. 4 June 2011. Retrieved 6 October 2012. ^ Singh Singh, Ravi Shekhar (2005). Asian Strategic And Military Perspective. Lancer Publishers. p. 368. ISBN 978-81-7062-245-1. ^ "USS Jack Williams (FFG 24)". Navsource Online. Retrieved 4 October 2012. ^ "NSA Bahrain History". Naval Support Activity Bahrain. Retrieved 4 October 2012. ^ "U.S. Hypocrisy on Parade: Washington Arms Bahrain, Denounces Russia For Arming Syria". Forbes. 18 June 2013. ^ "Welcome to Naval Support Activity Bahrain". Commander, Navy Installations Command. Archived from the original on 6 October 2012. Retrieved 5 October 2012. ^ "U.S. Backs Saudi-Led Yemeni Bombing With Logistics, Spying". Bloomberg. 26 March 2015. ^ "Saudi-led coalition strikes rebels in Yemen, inflaming tensions in region". CNN. 27 March 2015. ^ "Yemen crisis: Who is fighting whom?". 28 March 2017 – via www.bbc.com. ^ "Airstrike Hits Doctors Without Borders Hospital in Yemen". ^ "Yemen conflict: MSF hospital destroyed by air strikes". 27 October 2015 – via www.bbc.com. ^ "UK opens Persian Gulf military base in Bahrain". The Washington Post. 5 April 2018. ^ "Bilateral Relations". Ministry of Foreign Affairs, Bahrain. Retrieved 27 June 2012. ^ "Ministry of Foreign Affairs, Bahrain". Retrieved 27 June 2012. ^ "Palestine Peace Process". Ministry of Foreign Affairs, Bahrain. Retrieved 27 June 2012. ^ "Member States of the GCC". GCC. Archived from the original on 16 July 2012. Retrieved 27 June 2012. ^ "A Bahraini Hunger Strike And An Inhumane Argument Read more: A Bahraini Hunger Strike And An Inhumane Argument". NYU Local. 13 April 2012. Retrieved 27 June 2012. ^ "Bahrain slams Iran's claims, suspends gas deal talks". Xinhua News Agency. 20 February 2009. Archived from the original on 3 October 2012. Retrieved 27 June 2012. ^ a b c d "History of Municipalities". Ministry of Municipalities Affairs and Urban Planning – Kingdom of Bahrain. Archived from the original on 13 December 2012. Retrieved 5 July 2012. ^ a b "Governorates of Bahrain". Statoids. Retrieved 5 July 2012. ^ "Bahrain Government". Permanent Mission of the Kingdom of Bahrain to the United Nations. Archived from the original on 3 June 2012. Retrieved 5 July 2012. ^ "Three Polls, Three Different Approaches". The Estimate. 17 May 2002. Archived from the original on 3 October 2012. Retrieved 5 July 2012. ^ "Decree No.17 for 2002" (PDF). Capital Governorate. Archived (PDF) from the original on 3 October 2012. Retrieved 24 June 2012. ^ "Gulf Daily News » Local News » Central Governorate dissolved". ^ "Bahrain Becomes a 'Major Non-NATO Ally'". Voice of America. 26 October 2001. Retrieved 24 June 2012. ^ "Freedom House. Bahrain". freedomhouse.org. Retrieved 13 October 2014. ^ "Bahrain calling – Banking & Finance". ArabianBusiness.com. 25 April 2008. Retrieved 27 June 2010. ^ "Bahrain fully stocked for Eid al-Adha: official". Al Shorfa. 3 November 2011. Retrieved 3 October 2012. ^ a b "Bahrain food import bill to zoom 128pc". Daily Tribune. 9 November 2011. Archived from the original on 17 January 2013. Retrieved 3 October 2012. ^ "Bahrain profile: Timeline". BBC News. 3 October 2012. Archived from the original on 6 October 2012. Retrieved 5 October 2012. ^ Dokoupil, Martin (21 March 2012). "Bahrain economy slows to 1.3 pct q/q growth in Q4". Reuters. Retrieved 29 June 2012. ^ "Local News » JOBLESS RATE 3.8PC". Gulf Daily News. 4 August 2008. Retrieved 27 June 2010. ^ "Khaleej Times Online – 85pc unemployed in Bahrain are females". Khaleejtimes.com. 4 August 2008. Retrieved 27 June 2010. ^ "Tourism sector performance" (PDF). Economic Development Board – Bahrain. Archived from the original (PDF) on 12 August 2011. Retrieved 17 June 2012. ^ "Popular Attractions". Bahrain Guide. Retrieved 5 October 2012. ^ "Tree of Life, Bahrain". Wondermondo. Archived from the original on 3 October 2012. Retrieved 25 June 2012. ^ CNN, Francesca Street (2019-01-23). "Underwater theme park opening in Bahrain". CNN Travel. Retrieved 2019-01-23. ^ https://plus.google.com/+travelandleisure/posts. "The World's Largest Underwater Theme Park Is Coming to Bahrain". Travel + Leisure. Retrieved 2019-01-25. ^ "Bahrain's 'Spring of Culture Festival' opens". TradeArabia. Retrieved 25 June 2012. ^ "Bahrain Spring of Culture 2012". TimeOutBahrain. Retrieved 25 June 2012. ^ "Traffic Statistics: December 2010" (PDF). Civil Aviations Affairs, Bahrain. Archived from the original (PDF) on 17 January 2013. Retrieved 5 July 2012. ^ a b c Elsheshtawy, Yasser (2008). The evolving Arab city: tradition, modernity and urban development. Routledge. p. 198. ISBN 978-1-134-12821-1. ^ Al A'Ali, Mohammed (18 March 2012). "Seaview blow for Manama". Gulf Daily News. Archived from the original on 4 October 2012. Retrieved 3 October 2012. ^ "Passenger Statistics". King Fahd Causeway Authority. Archived from the original on 17 January 2013. Retrieved 25 June 2012. ^ "Logistics and Infrastructure". Bahrain Economic Development Board. Archived from the original on 24 June 2012. Retrieved 4 July 2012. ^ "Bahrain – Transportation". Encyclopedia of the Nations. Archived from the original on 22 June 2006. Retrieved 5 July 2012. ^ "Getting around Bahrain". Lonely Planet. Retrieved 5 July 2012. ^ a b Group, Oxford Business (2008). Report: Bahrain 2008. p. 153. ISBN 9781902339979. ^ "VIVA subscribers surge". Gulf Daily News. Retrieved 4 July 2012. ^ "Arab Advisors Group reveals Bahrain's communications connectivity leading the region (press release)". AMEinfo. 5 August 2008. Archived from the original on 7 June 2011. Retrieved 12 September 2011. ^ "ITU Internet Indicators 2000". International Telecommunications Union. Retrieved 12 September 2011. ^ "ITU Internet Indicators 2008". International Telecommunications Union. Retrieved 12 September 2011. ^ "Market Information – No. of Licenses Issued". Telecommunication Regulatory Authority (Kingdom of Bahrain). Archived from the original on 15 May 2013. Retrieved 29 August 2013. ^ a b c d e f g h i j k l UNESCO Science Report (PDF). Paris: UNESCO. 2015. ISBN 978-92-3-100129-1. ^ "Bahrain's population crossed 1m in December". Gulfnews.com. 28 February 2008. Retrieved 3 June 2012. ^ "290,000 Indians in Bahrain". Gulf-daily-news.com. 5 July 2008. Retrieved 27 June 2010. ^ "Indian Community". Indian Embassy. Archived from the original on 7 March 2012. Retrieved 6 March 2012. ^ "Bahrain: metropolitan areas". World Gazetteer. ^ "Two ethnicities, three generations: Phonological variation and change in Kuwait" (PDF). Newcastle University. 2010. p. 11. ^ "Bahrain's Rainbow Nation in Manama". HotelTravel.com. Archived from the original on 27 February 2014. Retrieved 20 February 2014. ^ Pew Research Center's Religion & Public Life Project: Bahrain. Pew Research Center. 2010. ^ a b "Sunnis and Shia in the Middle East". Mapping the Global Muslim Population. BBC News. December 19, 2013. ^ a b c David Pollock (November 20, 2017). "Sunnis and Shia in Bahrain: New Survey Shows Both Conflict and Consensus". Fikra Forum. Washington Institute for Near East Policy. ^ Andrew England (October 3, 2018). "Shia complain of exclusion from Bahrain's political process". Financial Times. ^ Andrew England & Simeon Kerr (October 1, 2018). "Bahrain's Shia loath to give Sunni rulers election credibility". Financial Times. ^ "An unfair election in Bahrain will not satisfy the Shia majority". Economist. November 22, 2018. ^ "2010 Census Results". Archived from the original on 20 March 2012. Retrieved 15 June 2012. ^ Chana Ya'ar (28 November 2010). "King of Bahrain Appoints Jewish Woman to Parliament". Arutz Sheva. Retrieved 28 November 2010. ^ Habib Toumi (4 April 2007). "Bahrain defends contacts with US Jewish body". gulfnews.com. ^ Kettani, Houssain (June 2010). "Muslim Population in Asia 1950–2020" (PDF). International Journal of Environmental Science and Development. 1 (2): 143–144. doi:10.7763/IJESD.2010.V1.28. Retrieved 25 June 2012. ^ "Roundup on status of Baha'is in Muslim-majority countries". The Muslim Network for Baha'i Rights. Retrieved 26 August 2013. ^ a b c "Bahrain: Languages". Britannica Online. Retrieved 28 June 2012. ^ "Bahrain 2002 (rev. 2012)". Constitute. Retrieved 17 March 2015. ^ "Living in Bahrain". BSB. Archived from the original on 24 June 2012. Retrieved 28 June 2012. ^ "Bahrain's Education System". Ministry of Foreign Affairs. Retrieved 17 June 2012. ^ "Education in Bahrain". Ministry of Education Bahrain. Archived from the original on 17 January 2013. Retrieved 28 June 2012. ^ a b c "History of Education in Bahrain". Ministry of Education, Bahrain. Archived from the original on 18 January 2013. Retrieved 28 June 2012. ^ "Statistics for the academic year 2011/2012" (PDF). Ministry of Education, Bahrain. Retrieved 28 June 2012. ^ "King Hamad's Schools of Future project" (PDF). Ministry of Education, Bahrain. Archived from the original (PDF) on 16 September 2012. Retrieved 28 June 2012. ^ "Management Consultancy Group – Bahrain". InfoBahrain. Retrieved 17 June 2012. ^ "Health Care Financing and Expenditure" (PDF). WHO. Archived from the original (PDF) on 17 January 2013. Retrieved 26 June 2012. ^ "Healthcare in the Kingdom of Bahrain" (PDF). Ministry of Health, Bahrain. Archived from the original (PDF) on 27 February 2012. Retrieved 26 June 2012. ^ "Bahrain Society". American Bahraini Friendship Society. Archived from the original on 3 October 2012. Retrieved 26 June 2012. ^ "SMC admissions" (PDF). Ministry of Health, Bahrain. Archived from the original (PDF) on 11 October 2010. Retrieved 26 June 2012. ^ a b c "Combatting HIV/AIDS and other diseases in Bahrain" (PDF). United Nations Development Program. Archived from the original (PDF) on 17 January 2013. Retrieved 26 June 2012. ^ "Immunization Profile – Bahrain". World Health Organisation. Retrieved 26 June 2012. ^ "Country Profile- Bahrain" (PDF). WHO. Retrieved 26 June 2012. ^ "Diabetes in Bahrain". TimeOut Bahrain. Retrieved 26 June 2012. ^ "Noncommunicable diseases in Bahrain" (PDF). World Health Organisation. Retrieved 26 June 2012. ^ "Features of sickle-cell disease in Bahrain". Gulf Genetic Centre. Archived from the original on 13 September 2012. Retrieved 26 June 2012. ^ "Ambassador Nonoo highlights religious freedom in Bahrain". Diplonews. Archived from the original on 17 January 2013. Retrieved 17 June 2012. ^ "Meet the new GMA child wonder | Showbiz Portal". www.showbiz-portal.com. Retrieved 28 February 2016. ^ "2013 State Sponsored Homophobia Report" (PDF). International Lesbian, Gay, Bisexual, Trans and Intersex Association. p. 20. Archived from the original (PDF) on 19 July 2013. Retrieved 8 August 2013. ^ "Two Bahraini men jailed for dressing in drag". ^ Toumi, Habib. (5 February 2011) Bahrain arrests scores in raid on gay party. GulfNews.com. Retrieved on 7 November 2016. ^ a b c Bloom, Jonathan M. (2009). The Grove Encyclopedia of Islamic Art and Architecture, Volume 2. Oxford University Press. p. 253. ISBN 0-19-530991-X. ^ Fattouh, Mayssa. "Bahrain's Art and Culture Scenes". Nafas. Retrieved 22 July 2012. ^ Aldosari, Ali (2006). Middle East, Western Asia, and Northern Africa. Marshall Cavendish Corporation. p. 39. ISBN 9780761475712. ^ "Bahrain – The Arts and the Humanities". EveryCulture.com. Retrieved 21 August 2012. ^ al-Jayousi, Mohammed (7 February 2011). "Bahraini poet Ali al-Sharqawi looks to explore 'cosmic spirit' in his works". Al Shorfa. Archived from the original on 3 October 2012. Retrieved 21 August 2012. ^ Lewis, Paul (18 November 1984). "Eden on the isle of Bahrain". New York Times. Archived from the original on 3 October 2012. Retrieved 21 August 2012. ^ Meixler, Louis (20 September 1998). "An Ancient Garden of Eden Is Unearthed in Persian Gulf's Bahrain". Los Angeles Times. Archived from the original on 3 October 2012. Retrieved 21 August 2012. ^ a b Frishkopf, Michael (2010). Music and Media in the Arab World. American University in Cairo. pp. 114–116. ISBN 977-416-293-5. ^ "IMMAF confirms officials from 11 different countries for 2017 Brave International Combat Week". Mymmanews.com. 11 September 2017. Retrieved 19 July 2018. ^ "Other Sports: Bahrain top venue for MMA training". Gdnonline.com. 27 August 2017. Retrieved 19 July 2018. ^ "Cricket: KHK Sports to launch Bahrain Premier League". Gdnonline.com. 6 December 2017. Retrieved 19 July 2018. ^ "KHK Sports set to launch Bahrain Premier League for T20 Cricket | THE DAILY TRIBUNE | KINGDOM OF BAHRAIN". Newsofbahrain.com. 6 December 2017. Retrieved 19 July 2018. ^ a b "Bahrain – Sports and Recreation". Britannica Online Encyclopedia. Retrieved 3 October 2012. ^ "Bahrain Football Association" (in Arabic). Bahrainfootball.org. Archived from the original on 17 July 2012. Retrieved 27 June 2012. ^ "Who is really behind the Bahrain-Merida team? - Cycling Weekly". Cycling Weekly. 19 September 2016. Retrieved 10 August 2017. ^ "BAHRAIN - MERIDA - Teams". Tour de France 2017. Archived from the original on 10 August 2017. Retrieved 10 August 2017. ^ Duane Finley (20 August 2015). "The Fighting Life: The Rise of MMA in Bahrain". Bleacher Report. Retrieved 23 March 2017. ^ "Brave To Host 9 Events in Middle East in 2017; UAE to Have An Edition in March". ArabsMMA. 20 June 2014. Retrieved 23 March 2017. ^ "Bahrain News Agency | Bahrain to host IMMAF World Championships of Amateur MMA". Bna.bh. 31 January 2017. Retrieved 19 July 2018. ^ Noble, Jonatha (17 February 2011). "Bahrain GP2 Asia race cancelled". Autosport. Retrieved 25 March 2012. ^ Pleitgen, Frederik (18 April 2012). "Bahrain circuit boss: Race not a big risk". CNN. Retrieved 21 April 2012. ^ "Press Release: FIA Formula One World Championship – Bahrain Grang Prix". FIA.com. Fédération Internationale de l'Automobile. 13 April 2012. Archived from the original on 14 April 2012. Retrieved 13 April 2012. ^ "Clashes in Bahrain ahead of F1 race". Al Jazeera. 20 April 2012. Retrieved 21 April 2012. ^ Pleitgen, Frederik (18 April 2012). "Bahrain circuit boss: Race not a big risk". CNN. Retrieved 30 June 2012. ^ News Wires (21 April 2012). "Bahrain security, protesters clash ahead of Grand Prix". France 24. AFP. Retrieved 30 June 2012. ^ "Protests As Anger Over Bahrain F1 Race Grows". Sky News Online. 20 April 2012. Archived from the original on 23 April 2012. Retrieved 21 April 2012. ^ Taylor, Jerome; Tremayne, David (21 April 2012). "Rage against the Formula One machine". The Independent. London. Retrieved 21 April 2012. ^ "BIC: Drag Racing". bahraingp.com. Archived from the original on 17 January 2013. Retrieved 17 June 2012. ^ Joyce, M. (2012). Bahrain from the Twentieth Century to the Arab Spring. Springer. p. 52. ISBN 9781137031792. Mojtahed-Zadeh, Pirouz (1999). Security and Territoriality in the Persian Gulf: A Maritime Political Geography. Routledge. ISBN 978-0-7007-1098-0. This article incorporates text from a free content work. Licensed under CC-BY-SA IGO 3.0 UNESCO Science Report: towards 2030, ? ?, UNESCO, UNESCO Publishing. To learn how to add open license text to Wikipedia articles, please see this how-to page. For information on reusing text from Wikipedia, please see the terms of use. "Bahrain". The World Factbook. Central Intelligence Agency.